Wesserunsett Arts Council tours of 20 studios and galleries in its eighth year. 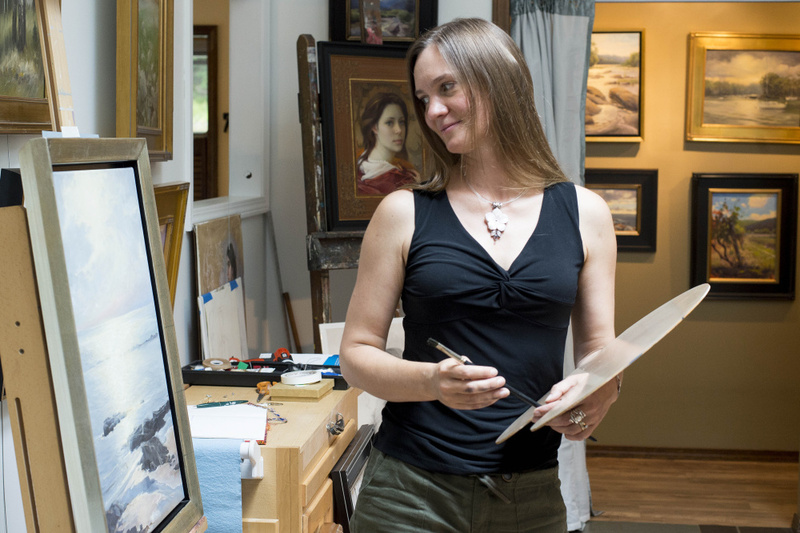 HARTLAND — Olena Babak sometimes draws on American-born artist James Whistler for inspiration. Whistler, who is quoted as having said: “An artist is not paid for his labor but for his vision,” like Babak, worked in portraits and realism. “To me it means you don’t just go and render art — if you do not have a thought or emotion of some sort behind it, it really becomes just a skillful rendering of an object,” she said. Babak, 39, who came to the United States as a 20-year-old refugee from Ukraine in 1997 not speaking any English, opened her studio and home gallery on Great Moose Drive in Hartland on Saturday as part of the eighth annual Open Studio Tour of artists’ barns, lofts, studios and gardens. Visitors to Babak’s home Saturday admired the stunning portraits and colorful landscapes, numbering more than three dozen around the studio. Rick and Lori McKinley, who live next door to Babak but had not yet seen her new renovated studio, said they have followed Babak’s art work online and now had the chance to view it in person. Babak said she travels a lot with her work, but has devoted her life to her art. Within that broad structure of “contemporary,” Babak said she leans toward realism in her portraits, figures and landscapes done in oil on canvas as well as with charcoal and pencil. Her inspirations in art come from the classical works of Michaelangelo and Leonardo DaVinci along with John Singer Sargent and Whistler. Some of her water landscapes are taken directly from Great Moose Lake and the Sebasticook River near her home. 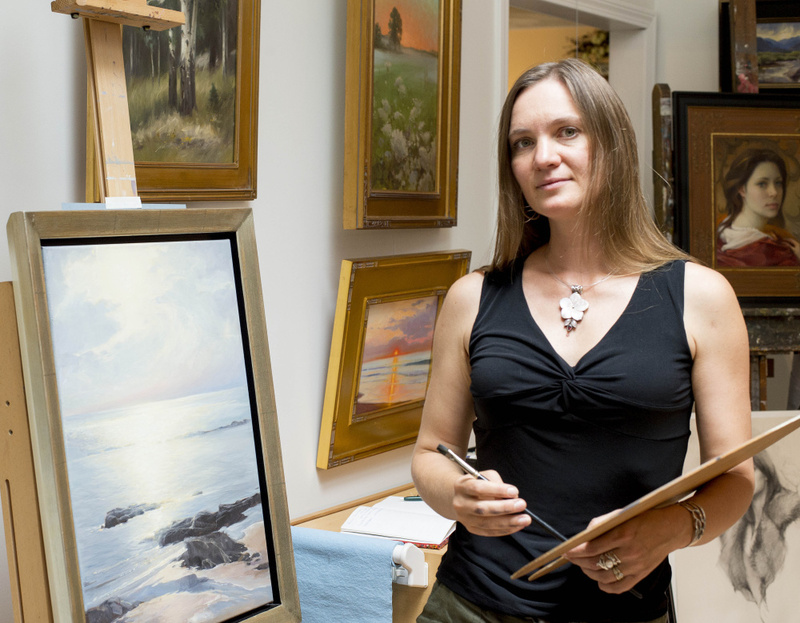 She sells her work online and has a travel calendar that brings her to galleries and art competitions all over the country. Babak was born in the village of Kharkiv, in Eastern Ukraine in 1977. She got her first formal art training in the Russian arts tradition, she said. She studied fashion design in the Ukraine and attended art school there as a teenager before filing for refugee status amid a period in her native country marked by economic and political instability. She arrived in the U.S. alone at age 20, finding a Russian community in 1997 where she settled and made a point of immediately learning to speak English through the Job Corps. She attended the Mims Studios and the Academy of Classical Design, in North Carolina, the Hudson River Fellowship in New Hampshire. She also studied art and graphic design at the University of Maine. She met and ultimately married Chris Ring of Pittsfield. They moved to the house in Hartland in 2012. Babak said her studio is open “by appointment or by chance” for visitors. The Wesserunsett Arts studio tours, which are free, took place Saturday at more than 20 locations in Mercer, Canaan, Skowhegan, Anson, Solon, Palmyra, Hartland, Wellington and other locations. 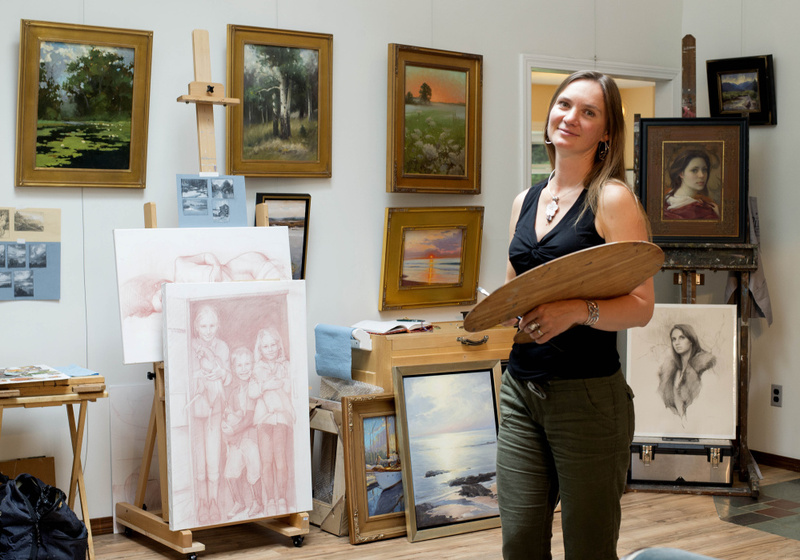 The idea of the open tours is to enable people to meet and visit with local artists and experience the connection each artist has with her or his rural Maine setting.